Monavale blueberries are one of the great treats of my Sunday visit to the farmers’ market. And at this time of year they’re at their best. There’s usually a line of people waiting to get their weekly fix of the delicious organic icecreams and smoothies. And they also make an amazing 100% blueberry juice (my favourite). Pretty much everyone agrees blueberries are good for us. They get glowing reports from health researchers, with high levels of antioxidants and other nutrients. And being organic maximizes the benefits. As this country’s largest organically certified blueberry orchard, Monavale are onto a very good thing. There’s a two-generation family team behind Monavale: Paul and Mieke de Groot, their son Marco and his wife Kath, and daughter Marije and her husband Richard Banks. The berries are grown on Waikato peat bog in the Moanatuatua Swamp, near Cambridge. 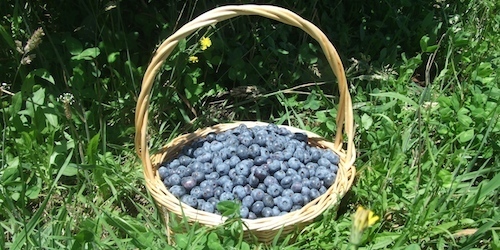 In summer there are orchard tours and “pick your own” opportunities, and “Café Irresistiblue” (open all year) features mainly organic and/ or locally sourced food, in particular delicious blueberry recipes. It’s in a great spot, with views across the blueberry orchards to the mountains, Pirongia, Maungatautari and Kakepuku. The de Groot family emigrated from Holland in 1980. Marco was 13, Marije was two. Younger sister Lisette was born in New Zealand in 1981. In Holland Paul was a greenkeeper and groundsman, developing and maintaining sports fields. In Auckland he was working for a bowling club and also doing landscaping, when they bought a 10-acre block of Waikato land covered in gorse, blackberry and manuka. Paul and Mieke were determined to farm organically. Paul had used agricultural chemicals as a greenkeeper, which had affected his health. They wanted to work their land, which had not previously been farmed, in an environmentally sustainable, natural and chemical free way. They have been certified organic with BioGro since 1993. They planted various crops, including pip-fruit, boysenberries, feijoas, beans, lettuces, tomatoes, courgettes, and strawberries. Soon they were specializing in blueberries, exporting to the United States, because there wasn’t a local market. Waikato peat bog (7 metres deep at Monavale) is ideal for blueberries. They’re proud they can work with the land instead of draining the wetlands for dairy farming. Approximately 75% of Waikato wetlands has been drained for farmland. Peat is important from an ecological and agricultural point of view. Says Paul: “You have to learn how to work with peat.” “We’re growing it,” says Marije. Growing blueberries organically is hard work, the family say, but worth it. Harvesting is October to the end of March. It’s labour intensive, as the berries are hand picked and don’t all ripen at once. During winter there’s orchard maintenance: mowing, scrub-cutting, weeding and pruning, all done by hand. In August organic fertilizers are applied. In September the bushes start to flower. The next couple of months they’re in frost protection mode, using a helicopter to move the inversion layer when necessary. In October the first blueberries ripen in tunnel houses. Towards the end of November the first outdoor berries ripen. They employ 150 seasonal workers over summer, and 11 fulltime workers. The berries are picked, graded, packaged and dispatched to market within 12 to 24 hours – it’s a fresh, perishable product with a shelf life of about two weeks. Imperfect berries –10 to 45%, depending on the weather at harvest – are frozen. Pheasants in the orchard eat grass grubs and beetles. They use some bird netting (birds get quite a few berries) but if they keep birds out completely, there will be a bug problem. Richard says netting also affects bees and other beneficial insects. They do use cannons to scare off the birds. They mix liquid fertilizers, using ingredients including fish and kelp. Soil and leaf tests are done once or twice a year. They also measure brix (sugar content). These days the brix of their berries is “off the scale”, Marco says. Richard and Marco are critical of growers who claim to be “spray free”. “But then you ask, ‘how do you keep the grass down?’ and they say, ‘Oh, we use Roundup.’ “ Marco says Roundup stops plants taking up manganese and iron – but these are crucial minerals. The family say the two-generation business has evolved, rather than being planned from the start. “Our parents started the business, and my sister and I helped out, and then we went off and got degrees,” says Marije. Meanwhile, Marco was working overseas. Then, opportunities arose to buy land adjacent to Paul and Mieke’s property. Although Marco didn’t initially intend to grow blueberries, he knew it was a good investment. Marije and Richard also bought land. In 2002 they combined into a family business, with Marco and Richard working fulltime at Monavale, while Marije and Kath were raising children as well as working in the business. With so many strong-minded family members,“we have robust discussions”, Marije says. But it works well, with shared values and a strong commitment to the business. They bring complementary skills: Marije worked in marketing, Richard was a teacher, Marco worked in civil engineering, and Kath studied humanities and law. It looks likely that a third generation will be involved. Marco and Kath’s seventeen-year-old son, Oliver, is studying horticulture at Lincoln University. Marco and Marije’s sister Lisette isn’t currently involved in the business, but they think that this may happen before long. Monavale berries are stocked by supermarkets and organic stores throughout New Zealand. Fresh berries and other products are also exported. Frozen berries are sold to baby food manufacturers, other growers and organic shops. Monavale also make added value products – juices, jams and preserves, dried blueberries, wines and liqueurs, and even lip balm. 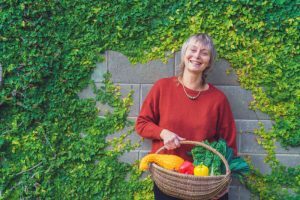 “We’re proud of our products and we do try to spread the word about organics,” says Kath. Educating customers about organics, and about blueberries, was a major reason behind the decision to open Cafe Irresistiblue in 2009. 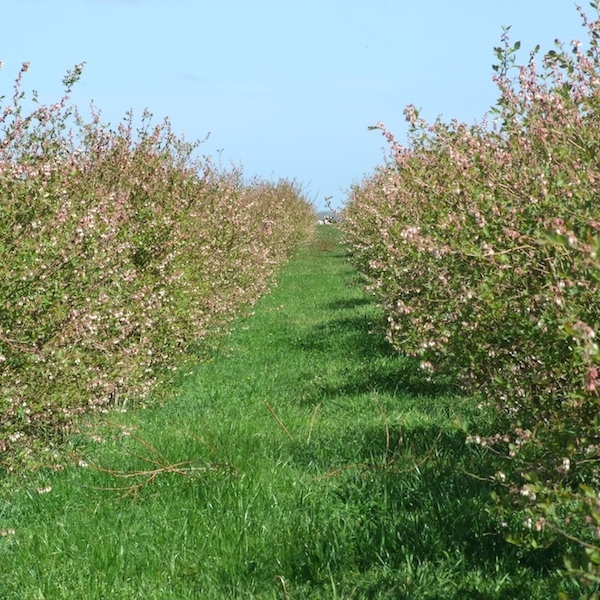 Monavale Blueberries is currently expanding, with another 20 hectares of bushes being put in. They’re aiming to extend the season and produce more volume at both ends. And also, this is another 20 hectares of peat bog that will be managed sustainably and organically.